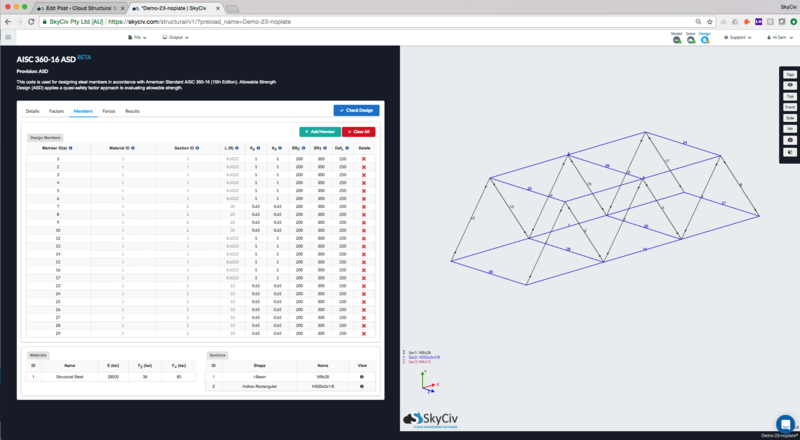 SkyCiv has built in design modules for both SkyCiv Structural 3D and SkyCiv Beam. These models are fully integrated - which means you model them in the program and all the results, properties and dimensions are loaded directly into the program, so that you don't have to spend the time re-entering all of this information. This will open up the module on the left side, which contains all of the information and input required to run a design check. For the most part, everything has been imported directily from the sections and results, so you can run the design software by clicking the blue "Check Design" button. The first tab Details, simply allows the user to add in more information about the project such as Project Name, ID, designer and notes. These will appear at the top of the reports generated by the design module. Factors are specific to each design module. Please visit the specific module documentation page for more information. The Members tab contains all the input related to the each of the members to be designed in the module. These may contain specific parameters for each design software (hover over the tooltips for more info). These can be changed at anytime by changing the values in the cells. The Design Member table contains all the members, their materials, section IDs, length and their limit factors that have been automatically populated from the model. You can also group together common members (for instance 1-3 will design members 1-3 as a single beam member). You can also delete certain members that you don't want to include in the design check. The materials and Sections (in the lower tables) are automatically populated from the model. You can hover over the icon for more information. 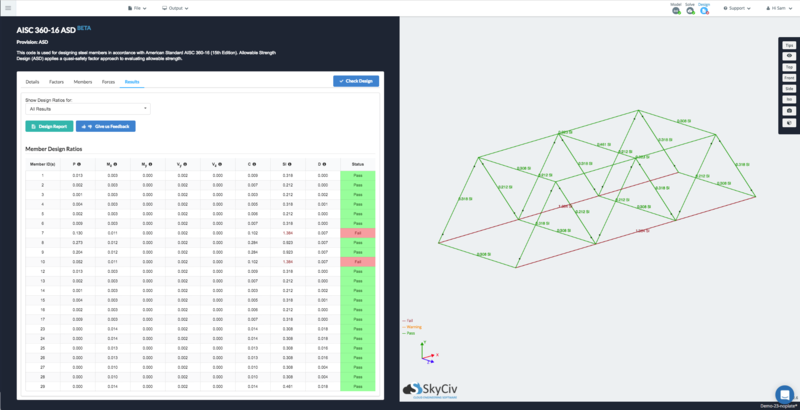 Internal member forces are automatically imported from the structural analysis, this includes load combinations. The software will display each of the forces as per the selected load combination. The software will design check based on the worst case for each member and load combination. Tabulated Results - these will highlight the members as Pass or Fail in green or red, respectively. , while green indicate the maximum member capacity ratio is < 1. A grey member will indicate that a design check was not performed on this member. You can also select specific design ratios, by changing the dropdown list of "Show Design Ratios for:" - this will show All Results (maximum capacity ratio) by default. Reporting - You can export a PDF summary report of the design checks at anytime.